For years, I’ve used heavy and relatively technical winter mountaineering equipment. But my needs are different now, and I’ve succeeded in reducing the weight of my ice axe and crampons by almost 900g. Here’s how I did it. I’ve used a variety of crampons in the past, starting out with Grivel G10s before owning CAMP Ice Riders (which wore out in less than two years), Grivel Monte Rosas, and finally Grivel G12s. In addition to climbing axes, I have always had a single mountaineering axe that covers 90% of my winter activities – first an old Mountain Technology Alpine axe, before upgrading to a Grivel Jorasses. The combination of Grivel G12 crampons and Jorasses ice axe served me well for five years, helping me complete a variety of objectives from Scottish Munros to Grade III winter climbs and 3,000m Alpine peaks. These items are versatile. The axe featured a 60cm shaft and a beefy steel head with reverse-curved pick, similar to what you’ll find on a dedicated climbing axe. This made it suitable both for general mountaineering and low-grade ice or mixed climbing. However, it weighed over 600g. The G12 crampons had long, sharp points and were equipped with a strap-on binding system making them compatible with any winter boots. In addition to general winter walking, these crampons were capable of climbing far harder than I ever was, and I’ve successfully used them to climb Grade IV routes. Together with heel plates from my old G10s (which had the strap-on bindings), they weighed a whopping 1.4kg. My current needs are far more modest. I am not a serious climber any more; I haven’t put on a rope since 2010, and I have lost interest in technical mountaineering due to the twin facts that a) you have to carry a hell of a lot of extra equipment, and b) I was never particularly good at it. These days I am a backpacker first and foremost, but I continue to participate in hillwalking and general non-technical mountaineering. I think I’ve passed through my climbing phase and, having gibbered and struggled my way up a number of terrifying Grade IV routes, am unlikely to aspire to those levels again. My current activities are far less vertical. On this day I made do without ice axe and crampons, but would have appreciated them. My old winter gear was starting to look overkill and heavy. It was time to lighten up. What do I need from an ice axe and crampons now? I think these requirements closely align with those of many winter hillwalkers, low-grade alpinists and backpackers in high-altitude regions. The gear may not be used at all, or only for short periods, so weight is absolutely paramount. They may be carried in a rucksack for the majority of any given trip. Crampons must be usable with a variety of footwear from winter boots to lightweight running shoes. Crampons must provide security on hard snow and ice up to about 40 degrees – potentially Scottish Grade I/II terrain at most, or Alpine PD-. They will mainly be used in combination with step kicking or the French technique. Very little front-pointing is expected, especially when I’m wearing running shoes in a backpacking scenario. 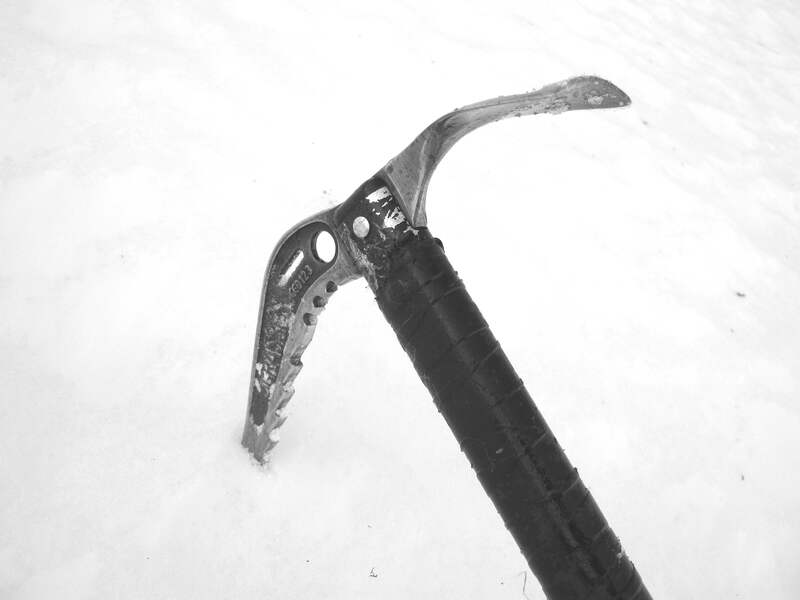 The ice axe will mainly be used in the piolet canne position to provide security on snow slopes – or the British variant thereof, in which the axe is held with the pick facing backwards in readiness for self arrest. It will also be used for cutting steps and daggering on steep snow, with very limited use of piolet traction (swinging the axe overhead). 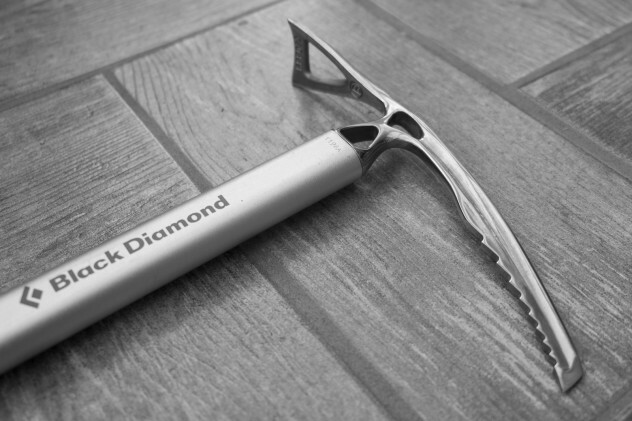 The Black Diamond Raven Pro is a classical ice axe and the truest modern expression of the traditional curved pick design. 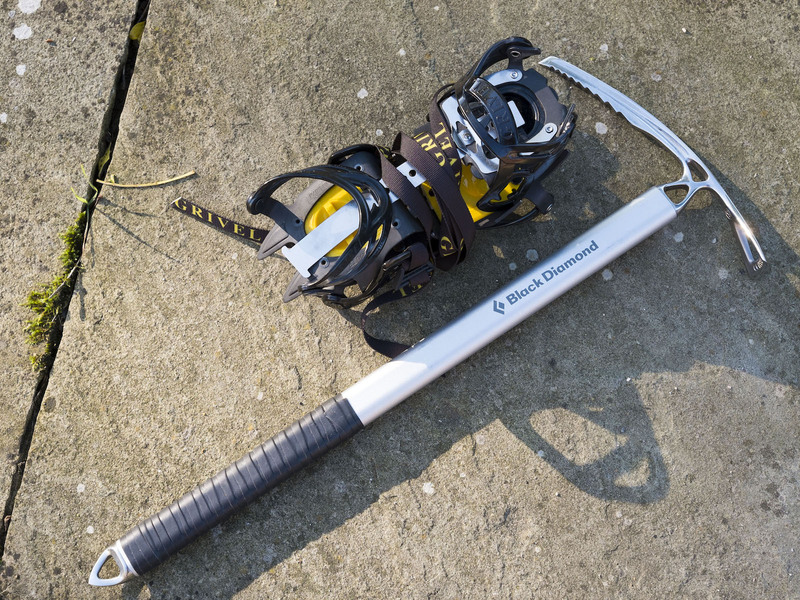 It weighs 416g for the 55cm model (measured, with pick protector and added rubber grip tape) which is heavier than some aluminium models, but this is a real ice axe with a steel pick, designed for serious use where rock could quickly blunt and damage an aluminium design. 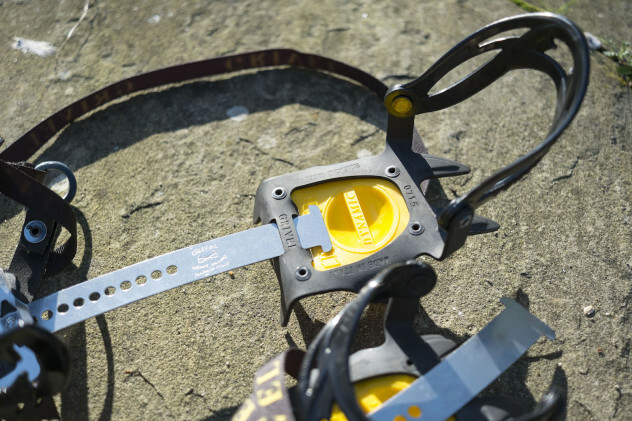 The curved pick is designed for general mountaineering on steep snow. I think this axe is perfect for my needs. It’s light, but it isn’t so light that its core function as a safety tool is compromised. And check out the beauty of that forged steel pick – it’s a classic design. When looking for crampons, I had a more difficult choice to make. 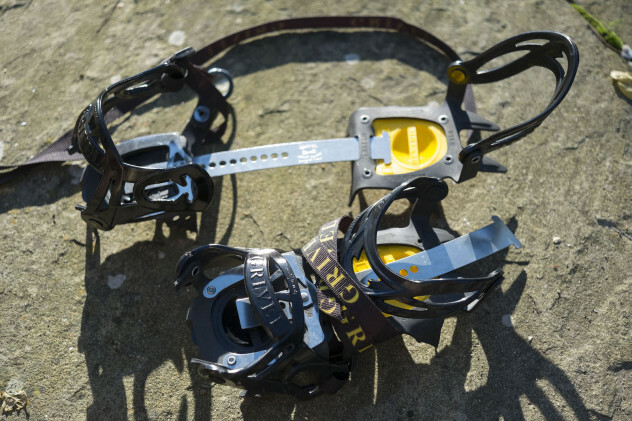 I immediately discounted aluminium crampons for the reasons outlined above (they aren’t durable enough for use in the British hills), but I wanted to find something that would be as light as possible while still giving me the traction I required. I seriously considered the Kahtoola KTS Steel crampons. They’re designed for flexible footwear and feature ten points, but the front points are angled downwards and I think their performance on graded ground would be poor. I do enjoy a winter gully or ridge every now and again, after all. My previous experience with Grivel’s Monte Rosa crampons (which, frustratingly, I sold years ago due to lack of use) had been quite positive and I liked the combination of flexible regulation bar and decently sized points – far bigger and more positive than the smaller points on the Kahtoolas. However, Monte Rosas still weigh over 800g. I eventually settled on the relatively new Grivel G1 New Classic. 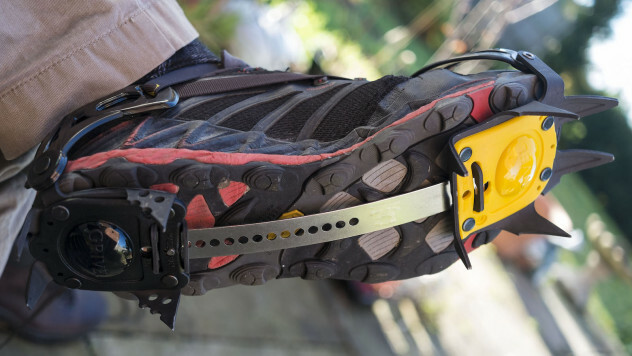 This model is Grivel’s simplest, lightest steel crampon. At only 760g you get crampons with ten sharp, full-size steel points, including real front points. 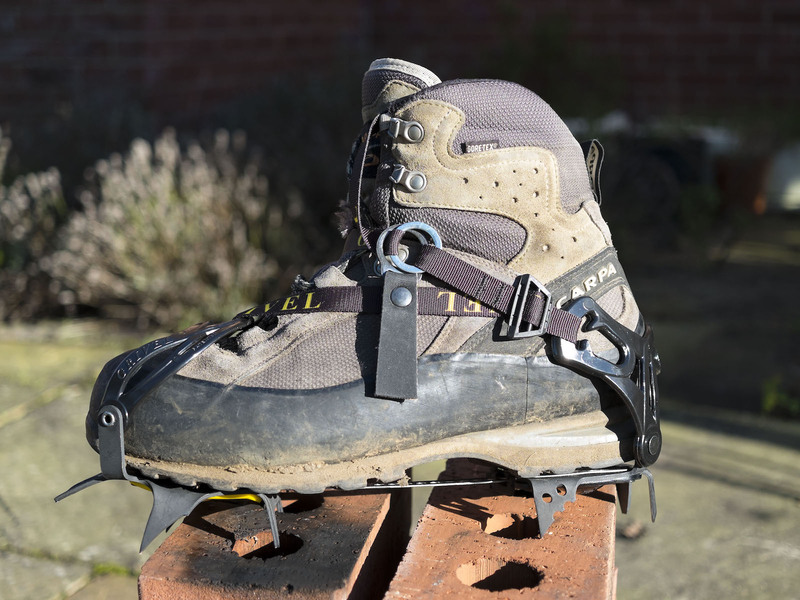 The highly flexible regulation bar makes it possible to use them with virtually any kind of footwear, and they have antibotts built in to stop soft snow building up between the points. In short, although very slightly heavier than the Kahtoolas, they tick all the boxes. Shown fitted to my Scarpa winter boots. A perfect fit. I have not used them in anger yet, but I’ve fitted them to every pair of outdoor footwear I own, and they fit everything. The main compromise with this design is that the sole has less ‘coverage’ from the points due to the much smaller front plate. There is a gap in the middle without any spikes. However, this shouldn’t be a concern with proper technique. Fitted to my trail shoes. 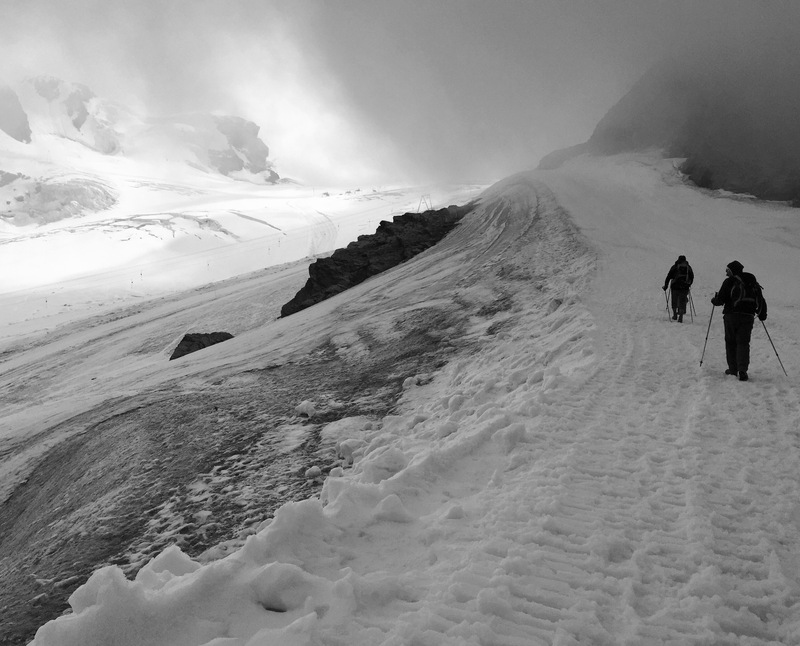 You can clearly see the reduced point coverage here – but the crampons fit. This setup weighs 1.18kg, down from around 2kg. That’s a significant weight saving with very little compromise in terms of features, and demonstrates how applying some thought to your gear – rather than just keeping using what you’ve always used – can result in a lighter pack. Lightweight backpacking is all about small gains like this (and learning what you can leave at home, of course!) I look forward to sharing my thoughts with these items of equipment after I’ve used them in anger.